You know how it is when children get an idea into their heads. They come out with statements like, “I want to be a magician” and think that it should happen immediately. The good thing is, there are plenty of easy card tricks for kids to cut their teeth on first and build up their skills from there. In this post I have featured 3 of the best starter card trick products that are low cost paperback books. They are ideal for the beginner although many people also choose to purchase Card Magic Kits or DVD’s that come with special decks. I will put up a post for both of these other formats when time permits. More often than not the kids who are interested in performing magic will want to be dressed for the part. Be it card tricks or any other form of magic. With children, role play does play such a big part in their everyday life naturally. Added a magician costume to the kit could be a good idea if their interest in magic continues. Dress-up play will provide many benefits to a child as they play out the part as close to the original character as they possibly can. Utilizing this strong imaginative energy can provide endless hours of fun for the kid and should be encouraged. Join in the fun with them. Especially when they have gone to lots of trouble dressing up in a costume and taken the time to practice their magic routines. It will certainly help grow their confidence and communication skills. Let’s take a look at what there is available for the budding magician who is interested in card tricks. 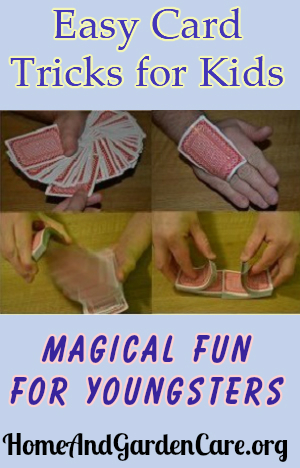 2 1) Easy-to-Do Card Tricks for Children by Karl Fulves. 4 3) Self-Working Card Tricks. 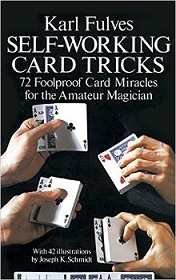 Books about card tricks are more often than not the cheapest form of training. These would avoid you laying out to much money especially if you think the youngster might lose interest in magic. To save you a bit of time sifting through all the easy card tricks for kids that are available, here is my short list. The following three books are those I feel are well worth considering. 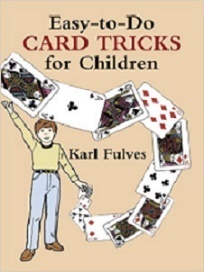 1) Easy-to-Do Card Tricks for Children by Karl Fulves. This is a paperback brought out in 1989 which is still selling today. The tricks taught in this book begin with the easiest to learn first. Moving on to the more difficult as you would expect. It contains 60 images to help the performers grasp the steps required to perform each trick successfully. Knowing what story to tell your audience is an important part of being a magician. Karl Fulves has included this as part of the content. Probably suited to children age 8 to 9 and upwards. Although you could help the younger kids though the book with any parts that they get stuck with. Check it out for yourself here. Again a paperback, this time brought out in 1999 but it goes into more than training us about tricks. This book goes heavy into all the hand maneuvers. Such as the glide, shuffles and flourishes. Accompanying the text which teaches 100 clever tricks are 120 images. 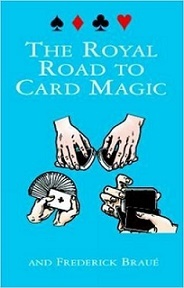 The book covers each card sleight of hand in turn and goes on to teach a number of tricks using that sleight. This is a much better idea I feel than covering all the sleights in one section and having to refer back to them with each trick you happen to be learning. An excellent product although a few people don’t recommend buying the Kindle edition due to spelling errors which slow up training. This is what the card magic book has to offer. A paperback edition of the book which has been around since 1976. For those who don’t know, self-working card tricks are tricks that you can maneuver to a successful completion using mathematics. Basically it depends how the cards are set out in a pile to start with that makes each trick work. You can tell a story as you place each card down. And if you know some false shuffles these too can make the trick even more interesting. One plus point with these tricks is that you could perform them with any pack of cards. No need to have that special deck with you when asked to show someone that trick you did last week. Nothing can be more embarrassing than having to refuse going through your performance. Especially with an audience who have been warmed up and are waiting. Some people are of the opinion that self-working card tricks are not really true magic. Others maintain if the audience is being entertained, appreciate the trick, are unable to work out what happened and want to see more then that is magic. Details here. #3 Self-Working Card Tricks with either #1, the Karl Fulves Easy-to-Do Card Tricks for Children or #2, The Royal Road to Card Magic. This would give the kid a choice to move on to the Self-Working card tricks which they might find easier to perform. Especially if they get stuck with the true magic tricks. Being able to perform something well will keep them interested and encourage them to go on to learn the more difficult tricks. You can also take a look at easy card tricks for kids in other training formats such as the DVD training and the Magic Kits.